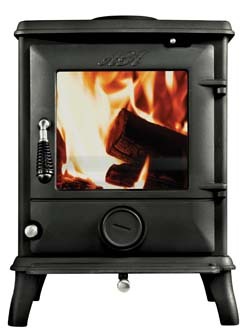 AGA Stoves employ the latest technology to ensure clean, efficient burning. Their cast iron construction helps retain and radiate the heat and Active Airflow Technology helps to keep the glass clear so you can see, as well as feel, the warmth. - Cast Iron and Contemporary Steel Alternatives. - Chrome Iron Grate - for longevity (some models also have an interchangeable woodburning plate too). - Stainless Steel After Burner - to reduce soot emissions. - 5-Year parts and 1-year labour warranty (doesn't apply to consumables such as glass, bricks etc). - User controlled primary air inlet - so you can control the heat. - Hand-built and visual check before leaving the factory. 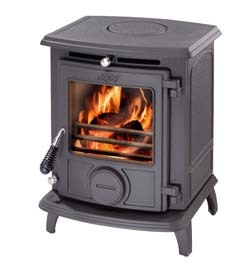 Coal burns for longer than wood meaning less time and effort is required to run your stove. Using smokeless fuel means you can use a stove to heat your home if you live in a smoke control zone. Renewable and the most environmentally friendly fuel. 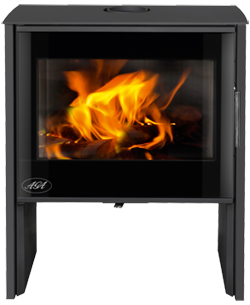 The 'SE' models are designed especially to burn so completely that it is approved to use in smoke control zones even when burning wood (you must only burn the fuel approved for use in the stove, generally clean [not painted or treated], seasoned wood). Not as environmentally friendly as plain logs (energy is used in manufacturing them and they are often transported a greater distance) but they do have the advantage of being a consistent size and 'calorific value'. This means they can be automatically fed in to some burners and are less time-consuming to deal with. 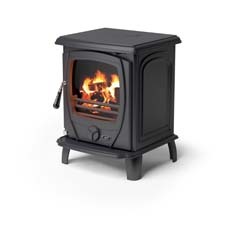 It's important to try and match your stove's output to the room size - too small and you won't be warm enough, too big and your stove will have to be run on a lower setting to prevent the room getting too hot. This means it will be less efficient and you will also get more 'sooting' on the door glass. 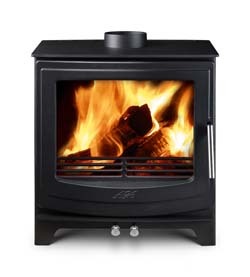 Delivery and installation is not included in our prices and it's important to have your stove installed properly. It's particularly important to have a good flue (a liner is always recommended in an existing masonry chimney) that terminates above the highest point of the building (or an adjacent building if there are any close by). The flue should be correctly sized for the appliance and should be vertical with as few bends as possible. Manufacturer's instructions (for the stove and flue system) should always be followed. Ventilation and fresh air are also very important considerations when any open flued appliance is installed - getting this wrong can lead to Carbon Monoxide poisoning. Fresh air is required to allow the correct operation and 'complete combustion' of whatever fuel is being burnt. 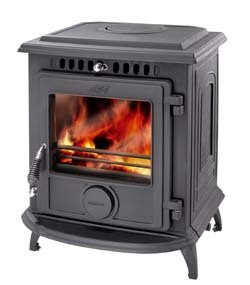 Some stoves have a requirement in their installation instructions for a certain size of air vent and others (below a certain threshold) may not. If you have other appliances in the same or an adjacent room (or machines like extract fans or tumble dryers that also take air to outside) this can mean an air vent is necessary even if the standard installation instructions don't specify one. AGA make matching cast iron pipe and bends for the stoves, in suitable sizes (125mm / 5" or 150mm / 6") and in either matt black cast finish, or in gloss black enamel finish. We stock some of the more popular lengths and sizes and can get others to order.